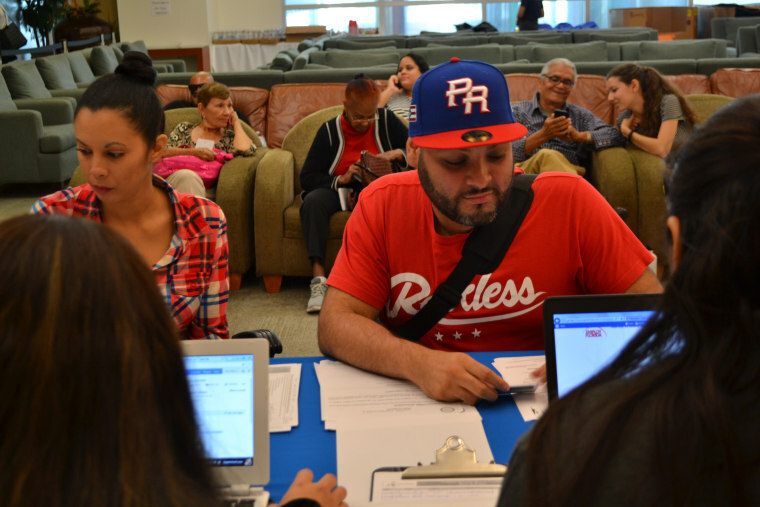 MIAMI – The exodus of Puerto Ricans to Florida following Hurricane Maria has reached a whopping 200,000 in just over two months, obliterating initial conservative estimates that had put the number at 100,000. Maria Teresa Rosado, 37, and her husband Luis Flores, 33, arrived in Miami over the weekend to start rebuilding their lives. Power has not yet arrived to their house in San Lorenzo, Puerto Rico. Wednesday, the couple was at the hurricane relief center at Miami International Airport, which was set up by the state to make it easier for those arriving to get settled. The couple said that as of now, they are not planning to return to the island even if power is restored and the economic recession subsides. Flores, a hospital worker, said he sometimes had to choose between paying the electrical bill or buying food. “There is more opportunity here for us to grow as professionals,” Rosado, who was a retail manager said. Hurricane Maria trounced Puerto Rico on September 20, and since then, families have been boarding planes to the mainland with no end in sight. Flights from the island are booked solid through the end of the year. According to the Florida Division of Emergency Management, over 208,000 people from Puerto Rico have landed at airports in Miami, Orlando, and Tampa since October 3rd. A total of 7,756 Puerto Rican students have enrolled in Florida public schools during the same period. The largest enrollments are in Orange and Osceola Counties in Central Florida, which has the heaviest concentration of Puerto Ricans. Many universities in the state have also waived out-of-state tuition fees for Puerto Rican students. Victoria Solá and Andrea Marrero, two friends, missed a semester of classes at the University of Puerto Rico in Río Piedras. They said although the university opened, they did not go to classes because the conditions were bleak with no power. The two young women, both 20, are set to begin classes at Florida International University in January. Marrero is staying with her grandparents and mother in Miami but for Solá, it will be the first time away from her family. “It’s going to be a big step,” she said, admitting she is nervous. Since the initial aftermath of the hurricane, Fernandez has predicted a total of 500,000 to 750,000 Puerto Ricans would leave the island in a four-year period. “As it turns out, 500,000 is now the low-end estimate for a five year period. It appears that it will be closer to 750,000,” according to Fernandez. He said the exodus is unfolding along several interconnected waves. First, the wave that was underway prior to the storm, which had reached a level of around 80,000 per year. Since the hurricane, a second wave has added to what was already a spike. A larger and longer-term wave will continue over the next few years, he said. Consequently, an already deeply indebted government will continue to see a sharp drop in the tax base, which reduces its ability to provide services and pay its debt. “In that sense, Maria was a perfect storm of destruction and economic ruin,” Fernandez said. The population of Puerto Ricans in Florida has swelled from 479,000 in 2000 to over one million now. Many of those were originally fleeing the island’s economic recession. But not all the Puerto Ricans arriving will stay for good. Some, particularly the older generations, will return. Amelia Villanueva, 73, and her husband Luis Acosta, 76, are both retired and arrived recently to stay with relatives for a few months. Their home in Levittown, a suburb of San Juan, has intermittent power but it wasn’t long ago that Acosta was making four and five hour lines to buy ice. “We need a break. We are nervous and depressed because we are not used to this situation,” Villanueva said. But she has faith that things will turn around and said the situation in Puerto Rico is already getting better. “The trees are starting to blossom again. We are beginning to return to normalcy,” Villanueva said.